Urinary tract infections can be the "bane" of our existence as caregivers of people living with dementia. UTIs are a cause of great distress. This happens to caregivers because urinary tract infection often go undetected even by doctors and physician assistants. Urinary tract infections in dementia patients don't always come with signs and symptoms. In dementia patients the signs and symptoms of a UTI are often silent. Persons living with dementia rarely tell us they have a UTI. Why? Because they don't know it. UTIs often cause dementia patients to become mean. when in fact these behaviors are being caused by an undetected urinary tract infection. Almost every caregiver I know will tell you "they suffered" enormous stress and anxiety as a result of an undetected UTI. One of leading causes of death in Alzheimer's patients is infection. 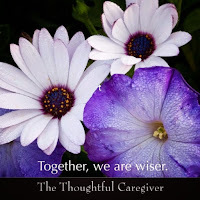 More than 10 readers of the Alzheimer's Reading Room have written to me and told me that their loved one died as a result of an undetected UTI that escalated to the point that the infection caused death. Every geriatric care manager I have ever met has told me that undetected urinary tract infections are one of the biggest, if not the biggest, problem that Alzheimer's caregivers face. If you are not aware of this, and if you are not actively looking for infections each day, it is very likely that you will suffer as a result of an undetected UTI. This can sometimes lead to a trip to the hospital emergency room or worse. Frequent Urinary Tract Infections make dementia patients mean, disoriented, dull and hard to manage. It took me years to discover that my mom, Dotty, was suffering from frequent urinary tract infections. The failure to understand and realize this caused an enormous amount of stress and anxiety for both of us. Undetected UTIs in dementia are common, and most caregivers will tell you they lived a "miserble" life until they learned how to control them. My mom's core temperature was 97.6. So when we went to the doctor and the nurse got a reading of 98.4, the perception was that Dotty was fine and dandy. It was only by accident that we discovered the problem. I asked our doctor to check my mother's hydration level. The results showed that she was hydrated; the result also showed that Dotty had a urinary tract infection. An undetected UTI even after she had been examined by both a physicians assistant and our doctor. I finally realized that Dotty was suffering from frequent "silent urinary tract infections"; and, this was having a negative effect on her behavior. As it turned out, I learned to take Dotty's temperature frequently. Subsequently, we caught 7-8 urinary tract infections that would not have been other wise detected. It is now clear to me that one of two things happened when Dotty had a urinary tract infections. She got agitated. Or, sometimes very dull like "not there". By checking her temperature daily we caught these infections quickly, long before they worsened, and before Dotty became meaner than a junkyard dog. However, it is not unusual for Alzheimer's patients to end up in a hospital emergency room and "out of it" as a result of UTI that goes undetected. The "out of it" and a big spike in temperature leads to the emergency room visit. At that point the infection might get diagnosed. Frequent, or strong infections can lead to memory loss. Memory loss that might never be regained. Infections in dementia patients can lead to hallucinations, agitation, and aggression. The single best way to prevent urinary tract infections is with frequent toileting, and changing of undergarments (or briefs). In other words, don't ever go longer than 90 minutes without "prompting a pee". Problem behaviors with dementia patients are more prevalent than most of us realize, this certainly included me. Most people assume that Dotty was a model Alzheimer's patient. Happy and sweet all the time. Well she was a model Alzheimer's patient for sure, but not all the time. She often became mean, confused, angry, agitated, and you might have called her Doctor NO at times. Once I learned the harsh lessons of the urinary tract infection and learned to cut them off immediately, the episodes of meanness and anger did diminish and they became easy to manage. I strongly recommend that you read through this topic, especially the first 5 articles. They will help you immensely. Please everyone be aware..my mother died from this it sent her into cardiac arrest. We can always tell when my mom has one because of her behavior. She will not make eye contact and her eyes are glassy. Her urologist has her on a low dose maintenance antibiotic. My mom has Frontal Temporal Dementia. So very true. Everything "domino-ed" from this issue with my mom. Serious UTI problems stemming from communication issues with ALZ eventually resulted in an ER visit and hospital stay which led to further immobility which led to blood clots in her legs which led to prescribing a blood thinner which then amplified the effect of a stroke she had which then left her paralyzed on half her body and unable to eat. The actual cause of death listed on her death certificate is aphagia which is the inability to swallow...but it all stemmed from ALZ and the bladder infection issue. I advise everyone to work hard at preventing their loved one from getting a UTI if at all possible. My mom had to be rushed to the emergency room because of an UTI. She was well into her illness ... dementia. She stopped talking and we didn't know what was wrong with her. She would nod yes if we asked "are you in pain " ? We were all extra careful after that when we cleaned her. I had one or two UTI's in the past and I felt so bad that she was in such pain. Yes they are. If your loved one frequently becomes agitated or starts sleeping a lot, check for UTI's. They are feeling bad but can't communicate this to you. Very true. We experienced this multiple times despite the utmost constant care. Moms type 2 diabetes always reared its ugliness as a UTI. Poor Mommy!! You left out a key provider in the lead to your story-Nurse Practitioners!!!!! Please read this. My mom would get them and look as if she had a stroke every time I took her to the hospital they would do stroke work up until I explained to them it was a urinary tract infection. Low blood pressure, dehydrated, could barely hold her head up. *** Bane a cause of great distress. A thing causing death. A source of harm. Title: "Can An Undetected Urinary Tract Infection Can Kill an Alzheimer's Patient"